As you may recall from our previous blog post on the topic, the predecessor of the modern day YogCorp was the exalted Государственный орган йогурта (Gosudarstvennyy Organ Yogurta, GOY) (State Yogurt Authority), the official government agency of the Soviet Union that maintained a monopoly on the production, regulation, and promotion of fish yogurt inside and outside of Russia. GOY was created in 1924 at the popular demand of Northern Russians. Business was slow at first, but under Stalin’s leadership GOY expanded dramatically. 200 factories opened within the first ten years. Fish yogurt became a huge hit among the starving gulag population, and thanks to the closeness between GOY and Stalin’s regime, gulag sales became a major source of revenue. 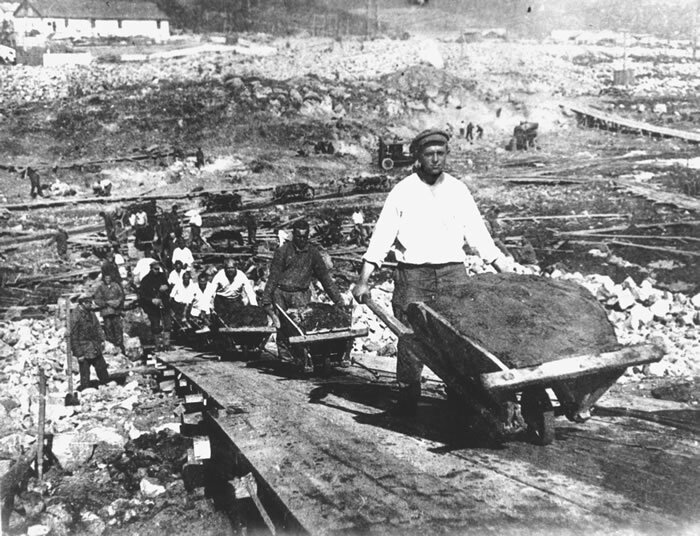 Business further expanded among refugees, political prisoners, penal labourers, starving non-gulag peasants, and World War II soldiers. All of this forced labour will make any gulag inmate hungry for some fish yogurt. When Stalin’s regime ended in 1953, prisoners were released from the gulag and civilians were no longer starving, which meant that the domestic market would no longer be profitable until GOY found another strategy. Their new strategy was to sell fish yogurt to Soviet schools. Public schools in the Soviet Union needed school meals for their students, and fish yogurt was perfect for them. It was dirt cheap, it could be made and transported in large amounts, and it was easy to force-feed to disobedient students. From the early 1950s to the late 1980s, fish yogurt was an iconic and stereotypical school lunch all over Russia. As Russian children during this time grew up eating fish yogurt from elementary school to high school, this created loyal adult customers as well, which guaranteed business for GOY in the domestic market for years to come. When the Soviet Union collapsed, GOY was dissolved and split into two new agencies: the российская йогуртная корпорация (Rossiyskaya Yogurtnaya Korporatsiya, RYK)(Russian Yogurt Corporation, YogCorp), and the комиссия по рыбному йогурту (Komissiya po Rybnomu Yogurtu, KRY) (Fish Yogurt Commission). The Russian Yogurt Corporation, branded as YogCorp, assumed responsibility for fish yogurt production and sales, and the Fish Yogurt Commision assumed responsibility for regulating fish yogurt. The days of forced labour, starvation, unappetising school lunches, and virtually guaranteed success thanks to state ownership, are long gone. GOY has fallen from being one of the Soviet Union’s most iconic enterprises to YogCorp, an unprofitable company long forgotten by most Russians. As such, President Putin wants to take the burden off of the Russian Government in operating this company and (most likely) dissolve it entirely and hand the administration of fish yogurt affairs back to Northern Russians, which was the status quo prior to 1924. The State Duma will vote to approve Putin’s proposal in June, and if the proposal goes through, YogCorp is scheduled for dissolution by 31 December 2020. By that time, any of its remaining assets will be nationalised into the Russian treasury and all responsibility for fish yogurt production and sales will return to Northern Russian village chiefs.